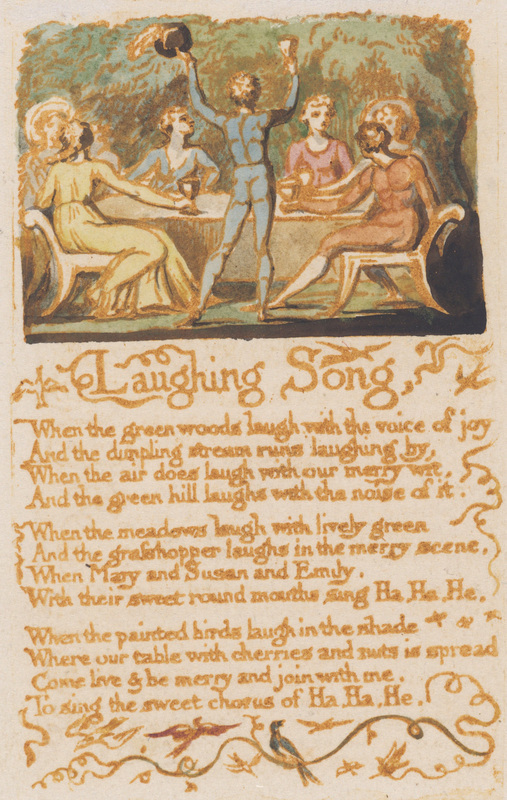 “Laughing Song,” Songs of Innocence, copy B, p. 10 (Bentley 15). 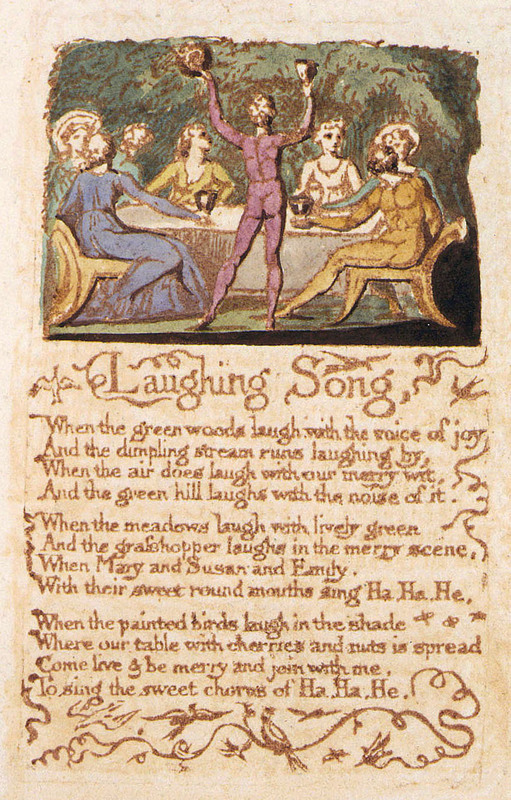 “Laughing Song,” Songs of Innocence, copy F, p. 8 (Bentley 15). The woman, it seems, has finished getting up and has left the party. Whatever the reason, we see a fragment of her at best. The woman does appear in the first extant impressions of this plate, so we know she should be there. But the fact remains: in one copy, a woman looks over her shoulder at something unknown, and in another, she is all but gone. And as I later learned, even her last trace—the shape that may be a shoulder—is absent from copy Z. Though these variances are almost certainly the result of mistakes in Blake’s or Mrs. Blake’s coloring, to discover them in my work felt as surreal to me as do any of Blake’s carefully crafted visions. What did Blake imagine this woman’s role to be? Why her strange posture? Was her removal truly a mistake? All of these questions interest me, all are almost impossible to answer, and none make any difference to the sheer oddity of this woman who approaches the vanishing point in some copies and returns in others. I don’t regret being unable to record these speculations in my notes on these copies. On the contrary, encounters like this reinforce my sense of my role as an editor, a textual curator who (at least sometimes) tries to be objective. By recording details as faithfully as possible, editors can reveal new mysteries for scholars to interpret—though rarely can we find answers. Blake, William. Songs of Innocence Copy B. Rosenwald Collection, Library of Congress, Washington, DC. 1789. Blake, William. Songs of Innocence Copy F. Houghton Library, Harvard University, Cambridge, Massachusetts. 1789. Pingback: A Woman Washed Away | Uncategorized | Aggregated blogs on Romantic Studies - please click through to read full posts.